Farley LaserLab's DF Contour CNC fiber laser cutting machine is designed for heavy industrial fiber laser cutting, with a laser source up to IPG's 6kW Fiber Laser and a transfer table to give both speed and efficiency to give your business a step into the future. Now with an even more affordable price starting at $450,000+ GST it means anyone can now start using the latest technologies for the business big and small. 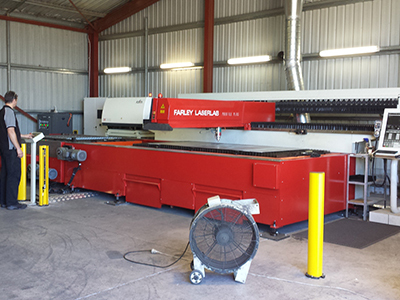 The $450,000 package includes the DF Plus machine, External Cover (required for Australia), IPG 2000W Fiber laser, IPG Water Chiller, Siemens Drives & Motors, Siemens CNC Controller, Cutting Table 3m x 1.5m, Transfer Table and the Precitec Laser Cutting Head. The Farley Laserlab Profile Plus is the best value for money laser cutting system available on the market today. The Profile Plus is a reliable, flexible, profitable and affordable laser cutting system. The Profile Plus is a complete laser cutting system incorporating a 1.5m X 3m high speed transfer table to reduce down time caused by loading and unloading. The Profile Plus comes with a Hass cutting head and Precitec Height following system. The Profile Plus runs all Siemens servos and drives with a Siemens 840D controller and Farley Laserlab HMI. The Profile Plus comes with a choice of laser resonators including PRC and Rofin. The Profile Plus is the best value for money laser cutting machines available with 1000's installed worldwide.